Jenessa is Aries, a nurse, union advocate and likes a good fight. Eric is Libra, Director of Nursing, and believes in compromise. 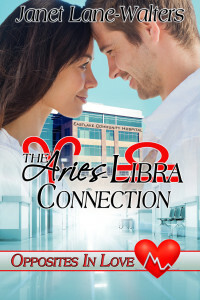 Can these two find a way to uncover the underhanded events at the hospital? They’re on opposite sides but the attraction between them is strong. She’s a widow who fought to save her husband’s life during a code. She feels guilty because the love she and her husband shared had died before his death. He assisted at the code but he feels guilty since he was the one who was responsible for the short staffing the night her husband died. Now they face falling in love and trying to solve the problems between the nurse’s union and the president of the hospital’s Board who wants a take over of the hospital by his hospital group. Is their connection strong enough to survive?